Zhou Xun: A Dreamlike Orange Story! In a melancholy and dreamy style, Oranges Have Ripened tells a tragic love story in a noble family at a time when individuality and love are suffocated by the rigid rules of the feudal society. Xiuhe, a peasant girl, is married to the master of a family to become his concubine, under his wife's arrangement. But she soon finds herself passionately attracted to her master's brother. Every character in this story is plagued by suppressed love and the responsibility for the family wears heavily on their shoulders. Zhou Xun portrays the innocent and intelligent peasant's daughter, Xiuhe. Her appearance and previous performance have left positive impressions on viewers. 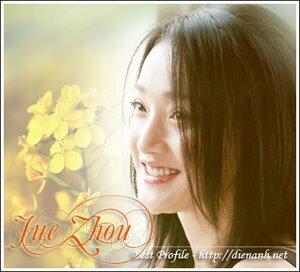 Most agree that she is the right choice of actress to play Xiuhe, the poor girl with a love dilemma. Nevertheless, she doesn't think it was an easy job. She couldn't help bursting into tears when she reviewed the edited shots, remembering how difficult performing this role had been. Xiuhe's admirer is portrayed by Huang Lei, a young actor with a strong intellectual style, best known for his excellent reincarnation of Xu Zhimo, the famous poet from the 1930s. the literary figure shares a similarity with the young brother in this drama, who also pursues liberation and free love. Ironically, despite fame, power and status, the family patriarch is actually a weak man in character. Kou Shixun plays the elder brother, a challenge he willingly embraced with his rich experience. The actress who plays the master's wife, Gui Yalei, is an ever£­green tree in the drama industry. A former Golden Horse best actress award£­winner, this experienced Taiwanese actress showed outstanding character control to reincarnate the ways of a complex woman who wants to retrieve her love through another young woman. In a subdued tone, the story described these people who pursues love in vain. Their emotions are ambiguous, and their way of revealing true feelings vague, with a touch of poetry, one of the most distinguished trademarks of Director Li Shaohong, which he also demonstrated to great effect in The Palace of Desire. Another characteristic of Li is the picturesque beauty of his scenes. The drama chose a town near Suzhou as its outdoor set, with beautiful views of river, and most importantly, with orange groves over the hills. The crew bought several thousand kilos of oranges, and then hung them in the trees one by one, to shoot the harvesting time sequences. In the drama, ripened oranges are a symbol of matured young women. Besides the scenery, the drama's picturesque style is also reflected in the costumes and cosmetics. The designer Ye Jintian, won an Oscar for best artistic director for Crouching Tiger, Hidden Dragon. The final result is superb. Zhou Xun and Gui Yelei put on so many elaborately designed dresses that the drama has also become a fashion show for Qing costumes. Love triangle in Perhaps Love ! "Perhaps Love" clears its way to Oscar ! Night Banquet's Opening Ceremony ! Hong Kong to Vote on Entry for Oscar ! "Perhaps Love" launches soundtrack ! Perhaps Love to open Christmas Day ! "Baby" producer makes Chinese musical ! "Perhaps Love" Vying for Oscar ! Romantic story weds top filmmakers ! Love interest steers Hu's direction ! The Creation of the Night Banquet ! Baober in Love - 2003 ! Shooting of Night Banquet begins ! The Night Banquet ready for production ! Zhou Xun's new film "Night banquet"
Cuộc đời bị đánh cắp đoạt giải phim hay nhất !